Made from the finest spices, herbs, floral extracts, aromatic oils and other natural ingredients. YESPRAY is a 100% Herbal repellent and odour remover which repels ticks, fleas, lice and Mites. YESPRAY is water based and is made from a matchless blend of Aromatic oils and plant extracts. YESPRAY when sprayed thrice a week on the body of dogs for 8 weeks will keep away Ticks, Fleas,Lice and Mites. YESPRAY has been developed as a replacement to the various chemical based products available in the market. It is safe, non toxic and eco friendly. Just Spray is a very effective 100% Herbal Mosquito Repellent Room Spray made from a unique blend of plant extracts and aromatic oils which keeps mosquitoes away for 8-12 hrs. Just Spray has been developed to eliminate the discomfort of using chemical mosquito repellents such as chemical vaporizers, chemical mosquito coils etc by a group of scientists from CIMAP, Lucknow which is a frontier Plants research institute of CSIR, Ministry of Science and Technology, Govt. of India. BUGSPRAY is a 100% herbal repellent which eliminates the eggs, nymph and adult sizes of bed bugs. BUGSPRAY is made from a unique blend of plant extracts and aromatic oils and has the ability to completely bring out the bed bugs hidden in crevices. BUGSPRAY also does not allow the eggs to hatch once sprayed on them. It is safe, non toxic and eco friendly. 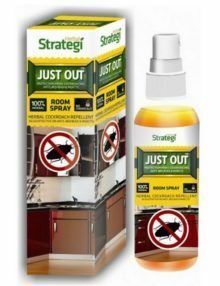 Just Out is a 100% Herbal Cockroach Repellent spray made from Natural oils and Herbal Extracts which is also effective against Ants, Bedbugs, Termites and Insects. Just Out has been developed as an alternative to the strong chemical insecticides used commonly to kill insects and which are poisonous to human beings as well. Just Out is safe, non toxic and eco friendly .A continuous spray of Just Out for 10 days in the Kitchen and Bathroom areas will repel Cockroaches, Ants and Bedbugs for 4-6 months. Sunlight: Place your terrarium in a bright area with indirect sunlight, (ex. windowsill, well-lit workstations). These terrariums are a closed system; it can get too hot if placed near a direct heat source and the plants may burn. Water: A properly maintained terrarium can go for weeks or months without needing water. Checking for condensation is the key. If the sides are never condensing, pour a half glass of water. If there is too much condensation that you cannot see your plants, then open the top of the container temporarily to allow it to dry. The pongamia cake manure are very good to use as organic fertilizers as they are a rich source of NPK : 4:0.5:0.5 Karanjin > 800 PPM, which improves soil fertility. Usage: Used widely on crops like Rice, Wheat, Cotton, Sugarcane, Fruits, Vegetables, Spices, Coconut, Tea and Coffee Gardens, Flower Plants, Aromatic Plants and Golf grounds. plant quick and healthy growth. – Spray at 7-10 days interval for 30 days after germination/transplanting. – Mix 5ml of Roboost in 1 liter of water and spray after 30 days after germination or transplanting at 7-10 days interval. Premium quality, beautiful round decorative pebbles available in lots of different colours. Ideal for floating candle displays, fish tanks, plant pots, wedding displays or just to collect! It is a stabilized gel made from sea algae based concentrate. It contains many different varieties of beneficial bacteria which act as a microbial inoculant in the soil. Effective Micro Organisms refer to both Aerobic & Anaerobic beneficial bacterial such as Photo Synthetic Bacteria, Nitrogen Fixing Bacteria and Phosphate Solubilizer. Micro Algae are natural and extremely efficient Nitrogen Fixers; such as Chrococus Turgidus. Seaweed gel is concentrated manure that is rich in micro organisms which co-exists in an environment of pH 6.5 to 8.5 and it easy to dissolve in water. After dilution, the microbes will multiply and thereby enrich the soil. Seaweed gel can also be sprayed on the soil or crop and can even be broadcasted with irrigation water to enrich the soil. It will ensure a healthy crop and thereby give a better harvest. Dilute 10 gms in 1 liter of water, root application is preferred. Cytokinins: Stimulates cell division in plants, kindles growth in lateral buds. Gibberellins: Promotes stem elongation, seed germination and flowering, growth of new leaves, young branches and fruits. Natural Proteins : Enhances plants chemical reactions. Natural Macro Nutrients : (NPK) Nitrogen, Phosphorus & Potassium. Natural Secondary Nutrients :Calcium, Magnesium & Sulphur. Natural Micro Nutrients:Copper, Zinc, Molybdenum, Boron, Manganese & Iron. Effective Micro Organisms refers to Aerobic & Anaerobic beneficial microbes like Photo Synthetic Bacteria, Nitrogen Fixing Bacteria and Phosphate Solubiliers.